Your heating, ventilation, and air conditioning (HVAC) system probably isn't something that you think about very often. In the summer months, your AC makes life bearable when it's 100 degrees outside in Olathe, while your heater keeps your toes from freezing and falling off during the long Kansas winters. As long as those two things are doing their jobs, you probably don't give them much thought. However, your Olathe heating and cooling system is more than just an AC and a heater. There are ducts and vents, air filters to be changed from time to time, and a thermostat that manages it all for you. That all seems simple enough, though, so what's the big deal with annual heating and cooling system maintenance? The simple fact is, your HVAC system is your home's biggest and most expensive appliance, even though you may not think of it like a refrigerator or stove. It's expensive to run, accounting for an average of almost half your utility bill, and it's expensive to fix or replace if something breaks down. That's where preventive maintenance comes in! Sure, when an Olathe heating and cooling specialist comes out for an annual checkup, they'll replace your air filters, but that's just one of the many steps that goes into a maintenance visit. If it's early spring, they'll also test your thermostat, inspect the condenser coil, check the refrigeration, make sure that all safety devices are in proper working order, inspect and tighten connections, check the fan blades, test the capacitor, measure the supply and return temperature differential, inspect the ductwork and the compressor, check all the fittings for signs of leakage, clean the condensate drains, and perform seasonal maintenance on the humidifier. You probably didn't even know that your air conditioner had so many different parts to check, clean, and maintain! If it's early autumn, your service technician will perform many of these same duties to ensure that all your ductwork and other systems are in good shape, while also testing for safe and proper operation of the ignition and exhaust systems, cleaning the furnace burner and heat exchangers, measuring and adjusting gas pressure on gas furnaces, checking the amperage on the blower motor, and monitoring all fittings for possible natural gas leaks, to name just a few. Your service technician will also adjust or balance the duct dampers so that proper areas of your house are getting warmer or cooler, depending on the season. What Else Do You Get with Your HVAC System Service Visit? What's the Value of an Annual Checkup for Your Heating and Cooling System? Given all the stuff we just listed, you're getting a lot of bang for you buck with an HVAC system inspection and maintenance visit. Of course, routine maintenance has value beyond what's done that day. Just like preventive maintenance on your car, regular check-ups help to ensure that your HVAC systems have a longer life span. Life expectancy for a typical furnace is about 16 years; air conditioners and heat pumps last about 14 years. The average hot water heater needs to be replaced after about 10 years. None of these appliances are cheap, and routine maintenance can help prolong the life of each one of these valuable items. Routine maintenance also helps your HVAC system to run more efficiently, which means a more comfortable home and lower utility bills all year long. Add to that the peace of mind that comes with knowing that your HVAC system has been inspected and is running cleanly and safely, and you can see how valuable regular maintenance is. Why Choose Davenport Service Company in Olathe for Your HVAC Maintenance? When it comes to heating and cooling in Olathe, we know what we're doing. But we also don't expect you to just take our word for it. We're confident in our service technicians and our results, which is why we offer a guaranteed up-front price before we start any work and a one-year warranty on all parts and labor for any repair that we perform. Your Olathe heating and cooling system takes care of your home and your family, so when you want someone to take care of it, you want the best. 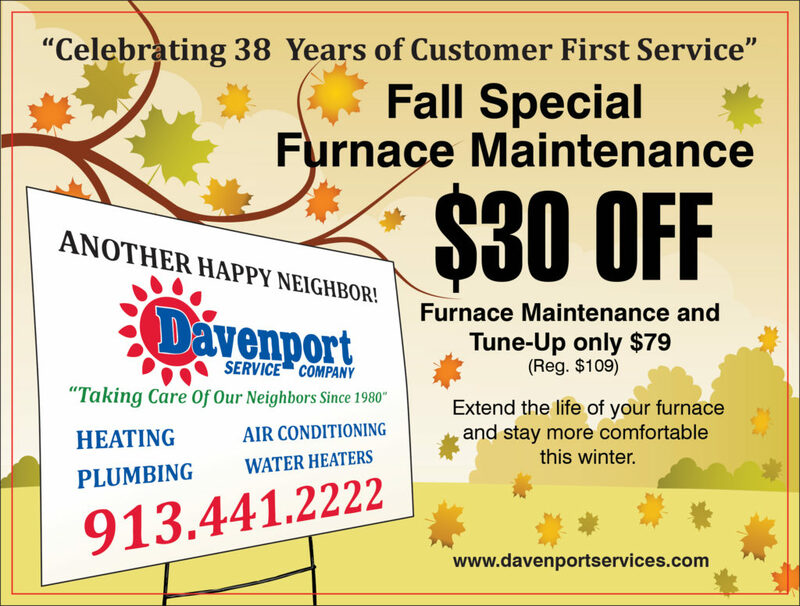 To schedule your annual maintenance check-up or for any other HVAC service, call Davenport Service Company today at 913-441-2222!